Who I am today is a reflection of all the sacrifices my immigrant parents made to achieve the American Dream. 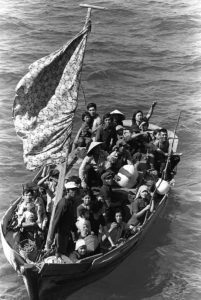 In the late 1970s, my parents fled the Communist takeover of Vietnam, leaving behind family and friends and spending weeks traveling by boat to come to the U.S. for a better future. 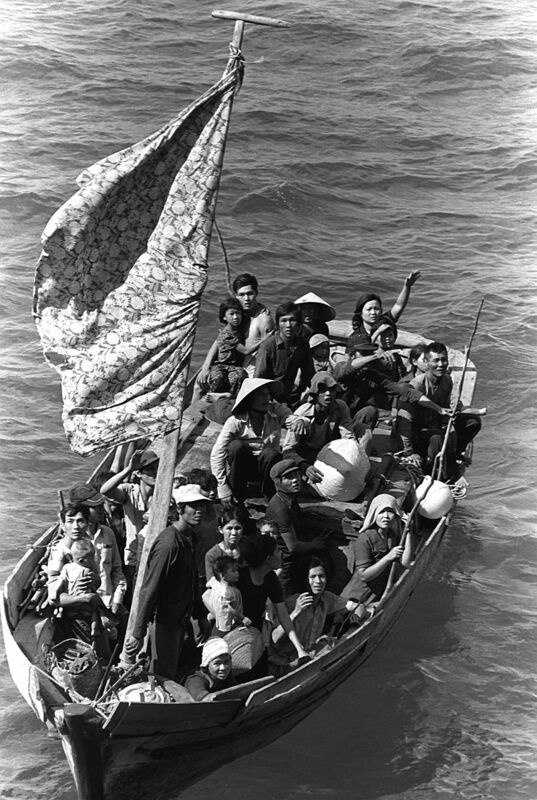 Vietnamese refugees traveling via boat. Having arrived with little money and limited English fluency, my father worked long hours at a blue-collar job while my mother stayed home to take care of my younger sister and me. My parents always found ways to provide for my sister and me with what little resources they had, using their own hardships to inspire us to achieve more than they could have. I could not be prouder to be the daughter of “boat people,” refugees, and immigrants, a sentiment I hope the refugees and immigrants being turned away at our borders today due to the targeted travel ban will eventually share. It may be easy for me to empathize with these affected refugees and immigrants because our shared experiences categorize us as part of the same in-group. In social psychology, an in-group is a social group arbitrarily defined based on similarities among its members (e.g., citizenship). And if you’re not an in-group member, then you’re likely to be denigrated as an out-group member, simply for your dissimilarities. Importantly, while there are often no objective differences between in-groups and out-groups, classic social psychology experiments show that minimally defined groups, such as being on a meaningless “blue” or “yellow” team, are sufficient for eliciting out-group bias, even in children as young as 6 years old. This “Us vs. Them” mentality results in people being more likely to help in-groups and discriminate against helping out-groups. While helping in-groups may promote social connection, choosing not to help out-groups may cultivate feelings of rejection or exclusion, reinforcing group boundaries in society. During a time when Americans’ attitudes and behaviors are especially rife with out-group prejudices, how can we encourage aid and support for those less similar to us? A recent study by Dr. Grit Hein and colleagues used neuroimaging methods to probe whether out-group biases that emerge implicitly in the brain can be changed through experiencing more positive interactions with out-groups. The researchers used a learning intervention in adults to examine whether attitudes and empathy toward out-group members would change after receiving help from an out-group member (experimental condition) just as often as an in-group member (control condition). Because it is more unexpected to receive help from an out-group member relative to an in-group member, the researchers hypothesized that experiencing more of this unexpectedly positive outcome would increase positive associations with out-group members. Indeed, Hein and colleagues found that experiencing unexpectedly positive out-group interactions led adults to develop more positive attitudes towards out-group members, which in turn increased empathy-related processing in the brain (i.e., greater neural activation in the anterior insula) to out-group members. Especially promising, increases in out-group empathy were achieved after only two positive learning experiences with out-group members! Thus, while our perceptions of out-group members — like refugees and immigrants — are often biased and may lead to negative societal consequences (e.g., intergroup conflict), the results of this study highlight just how malleable these arbitrary intergroup distinctions can be. By increasing how often we interact with people less similar to us — whether those differences are by race, citizenship, or whatever arbitrary feature that we think divides us— we can learn to be more accepting of every person’s unique and important contribution to the fabric of our nation. After all, we are each united in our pursuit for the American Dream. Peer edited by Alissa Brown and Christine Lee.